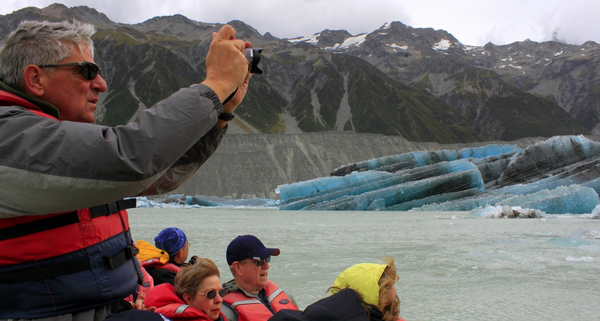 Guests aboard Glacier Explorers boats today (January 31) witnessed the result of a spectacular glacier calving at Tasman Glacier Terminal Lake that occurred around daybreak today – believed to be the largest since the Block and Basal* calving triggered by last February’s Christchurch earthquake. Long term glacier observer and General Manager Tourism for Aoraki Mount Cook Alpine Village Ltd, Denis Callesen said he believed today’s calving would again have moved around 30 million tonnes of ice – around the same amount as last February. “It was an absolutely magnificent event. A huge chunk of ice has literally broken away from the terminal face, and then fractured into dozens of icebergs. This is the first time that a calving has occurred across the whole 650m-wide terminal face,” said Mr Callesen. 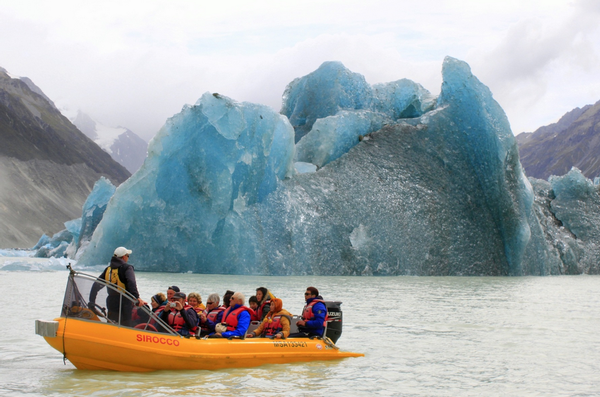 The calving means Glacier Explorer guests are assured superb viewing conditions on Lake Tasman and an extraordinary view of nature in action for at least the rest of this season. Photographers have only several hours to capture images of the crystal-clear ‘blue ice’ on the base of an iceberg, hidden beneath the surface for more than 300 years, before it oxidizes on exposure to air and turns white. Visitors will see blue ice every day for several months, as from the dozens of new icebergs, one or two will roll over every day as they maintain their equilibrium of 10% above and 90% below the water surface. *Basal iceberg or 'growler' means the action has come from below the water surface, while Block has come from above water level.